HELLO DARLIN’S: Moms Got Something to Tell You! A Schemata-clad African-American Lesbian Walked that Fine Line Between Good Taste and Unemployment, while Making $10,000 a week. 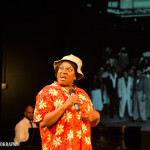 Josephine Howell, an actress and singer, starred in a One-Woman & Pianist Show about the life and work of “The Funniest Woman in the World,” Jackie “Mom’s Mabley at Langston Hughes Performing Arts Institute. Born in the 1890’s in the South, Mom’s Mabley’s career started with black vaudeville in the 1920’s on what is called the “Chitlin’ Circuit”. In the early 60’s, with the popularity of recorded comedy routines, of which she made 50, she began to reach a wider audience. Her career continued well into the 70’s on TV variety shows such as the Smothers Brothers Comedy Hour and the Ed Sullivan Show, as well as mainstream movies. In 1969, at the age of 75, she recorded a hit record “Abraham, Martin and John” about the assassinations of Pres. Abraham Lincoln ,The Rev. Martin Luther King Jr. and Pres. John F. Kennedy, all major players in African American Emancipation. Among the themes of her jokes were infidelity, race, civil rights clashes, the unattractiveness of “old geezers” and the well-founded fear that emigrants from the South have about re-crossing the Mason-Dixon line. However, she could also be hilariously funny about the most uncontroversial mundane things that spoke to the universal human experience. Hello, Darlin’s, written by Dan Owens, combines material from her various performances, from her early days to her TV performances, interspersed with her talking to the audience about her life as well as the history she witnessed. From 1900 until 1974 when she died, she witnessed plenty: the murder of Emmett Dill, WWI and WW II, the 1954 Brown vs. Board of Education ruling, the turbulence of the 60’s, the “Afro” hair fashion and of course what being a stand-up comic meant to her and to her audience. Josephine Howell’s performance was a tour-de-force. She is a singer par excellence, and has the same amazingly expressive face as Moms, which serves any comic well. The part was a huge athletic feat, because the Moms persona had a very gravelly back-placed ultra-thick Southern accent; nevertheless, Ms. Howell’s energy and passion never flagged. A World Premiere, Dan Owns’ play served to show off Moms and Ms. Howell’s immense talent, and the historical legacy embedded in the script was awe-inspiring. One could not help but be struck by the fact that in 2013, there were people in the audience who remembered watching a woman on TV, who had been raised by her slave-born grandmother. To highlight the historical legacy, director Jackie Moscou added a power-point backdrop with pictures, which visualized Moms reminiscences about the famous people she had worked with and the historical landmarks of Harlem, such as the Apollo and the Cotton Club. Cedric Thomas as Luther the Piano Man (and sometimes checkers partner) provided wonderful accompaniment.